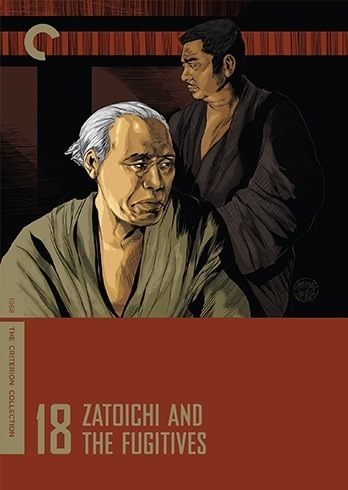 It has been six months since I last blogged about Zatoichi, and that seems about right. Even though the series is often formulaic and closely resembles a TV series, there is still a great deal more artistry than in most mainstream productions. My good friend David Blakeslee recently discussed the perils of treating the Criterion Collection as a checklist, which is even more tempting with this box set that has functioned as a book-end for the last two years (seriously). One disc at a time every months feels like the right way to let this series breathe, even if I am technically binging and having a triple feature. Having finished this disc, I wonder whether I would have thrown in the towel if I had continued to binge last time. Fortunately I did not, as I would soon encounter one of my favorites of the series. I had a feeling the series had hit a creative slump near the beginning of Outlaw. Some people are having an arrow shooting contest, when Zatoichi walks up and humbly picks up the bow. The others were shooting at large targets from a good distance. Zatoichi says he prefers a smaller target. Not only does he get what he requests, but a lady holds the tiny target as he unleashes the arrow. Any guesses on where it lands? I don’t have to answer that question. It isn’t fair to expect realism from a series where a blind man can annihilate a horde of opponents at once, but sometimes they take it too far. It would be a reach for Robin Hood to be able to hit the target that Zatoichi hits, and who would dare to volunteer to stand in front of a blind man and a projectile weapon? Outlaw did not get much better than there. The creative juices were nearly nil, as they went back to the well when drawing up the characters and the plot. Zatoichi goes to a town, finds some bad bosses who are taking advantage of peasants by cheating through gambling. He uncovers the operation by using a deft sword trick, and stands up for them. Zatoichi does go into hiding and becomes an outlaw, but his companions are excruciatingly bad comic relief. They are like the Japanese peasant version of the Keystone Cops, only not nearly as funny. What was most disappointing with this iteration is that there was potential to flesh out the character. He encounters another samurai who believes in non-violence, and there’s an ethical question given how many people Zatoichi has killed. It would be in the hundreds by this point, if not in 4-digits, which would have to weigh on a good man’s soul, but the thread is not pursued. Instead we get more bad comedy. The film nearly redeems itself with a good rain sequence near the end. It also ratchets up the gore, but this time some terrible practical effects quench the adventure and took me out of the picture. This is one of the low points. After seeing one of the worst, it was refreshing to see one of the best. Challenged follows some similar terrain as other episodes, but it gives a fresh spin and is well executed. There are two ingredients in particular that tend to make a Zatoichi film stand above the rest — a well developed peripheral samurai character and a child. The latter is central motivator, as his dying mother asks Zatoichi to find the child’s father. This is not unfamiliar, but this has a good child actor who has undeniable rapport with Shintarô Katsu. It is clear that the actor enjoyed being around children and probably helped them off the set, as the bond is easy to see in all of these films. Thus far, this was the best child and “uncle” dynamic. The other samurai is Tajuro Akatsuka (Jûshirô Konoe), a mysterious figure that we first meet while Zatoichi is traveling with an entertainment troupe. When they are accosted, the samurai defends them by non-violently using the back of his sword. He is tall with a wide frame, and stands straight in an imposing manner. He has some age on him, probably older than Zatoichi, and his motivation is mysterious. He immediately becomes one of the more interesting side characters that the series has introduced. There is an exceptional scene where we cannot tell whether there is tension or friendship between Zatoichi and this mysterious figure. 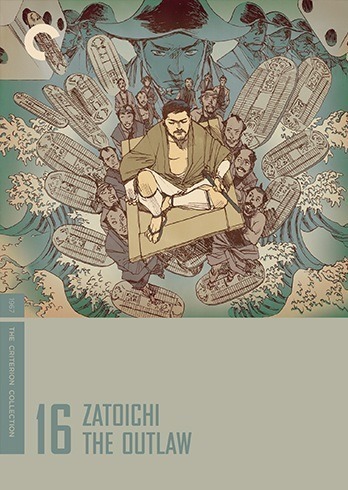 Zatoichi gives the man a massage, and is offered more than ample payment for the task. Zatoichi tries to turn down the payment. He has his honor and does not feel he has deserved charity. Initially Akatsuka appears to take offense at this rejection, and this scene could go either way. The two have just met and we are not sure whether they will be allies or enemies. Unlike the previous film, this one is cut together well and it heightens the tension and the uncertainty, not just in this scene, but in many. Even though few films are as predictable as a Zatoichi, this one unravels a little differently with both subplots. I will not give them away, but both are satisfying in a unique way. Challenged is now my second favorite Zatoichi film next to Pilgrimage. This section of the series is up and down, with highs and lows. Fugitives is closer to mediocrity, but like most of the series, is still highly watchable. One of the strengths is we get a truly great actor, Takashi Shimura, known for films such as Ikiru, Rashomon, Seven Samurai, and many others. He plays an aging doctor that kindly takes the swordsman into his home, allowing Zatoichi to ply his trade as a masseuse and earn an income. Dr. Junan is both ethical and giving to the town, as he gives more in service than he takes in income. At one point Zatoichi suspects him for being so altruistic, which may not be surprising since he encounters so many selfish characters. Junan also hates Yakuza, and is dismayed when he learns that Zatoichi considers himself to be one. If I were to criticize Fugitives, it is that Shimura is not given enough to do. He is terrific when on screen, and aside from Zatoichi, has the best character. He also has an interesting familial arc that intertwines with the main plot, but even that is not explored with as much depth as I would have enjoyed. The fugitives are the main plot, but they are underdeveloped and there are simply too many of them. 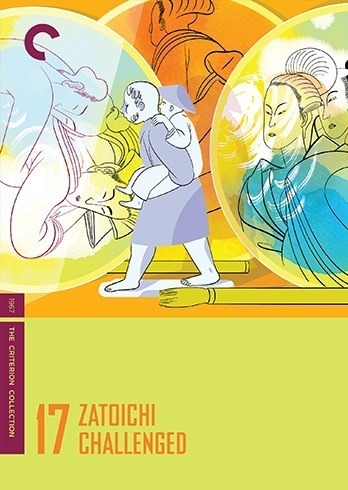 Often the Zatoichi series is too simple, and the characters too flat. In this film, the majority of the characters and all of the fugitives are perplexing. We don’t understand why they are hiding, who they are hiding from, and what their relationship is with the local bosses. What we do know is that they are antagonists. The series does well with action when they introduce different type of weapons. A group of 50 villains with short swords are as good as mince meat when facing the blind hero. His disadvantage is that he cannot see what is lurking in the shadows. One of the fugitives throws knives, and there is even a gun during one crucial scene. Zatoichi is not as superhuman and actually bleeds in this film, and the action sequences are well developed. If only we had fewer fugitives and more Shimura, this could have been one of the better episodes in the series. Posted on October 22, 2015, in Criterions, Film. Bookmark the permalink. 4 Comments. I hate to admit it, but I have only watched the first two films. I have so many other titles to view that it is tough to watch the same character work through a slightly different predicament over and over. I need to do like someone mentioned on a podcast (Criterion Cast maybe…or was it yours?) to set aside a Zatoichi Saturday or Sunday once or twice a month. I think Doug said that once, that he was going to do Zatoichi Fridays. I guess we’ll have to check with him whether that’s happened the next time he is on.